“Titan is the most interesting moon in the solar system. I think that gets me some enemies, but I think it’s actually true,” Shannon MacKenzie, lead author on one of the new studies and a planetary scientist at Johns Hopkins University’s Applied Physics Laboratory, told Space.com. But that doesn’t mean the moon is straightforward. “Titan throws us a lot of curveballs,” she said. MacKenzie’s study analyzes one potential curveball: three small features that appeared to be liquid-filled lakes when Cassini first spotted them, but seem to have dried up by the time the spacecraft returned to the area. The observations suggest that the liquid either evaporated or seeped into the surrounding planetary surface. But the situation may not be quite that simple, since the two sets of observations were taken by different instruments. Cassini was built to gather data with either its radar instrument or its visual and infrared light cameras, but not both simultaneously. And during the spacecraft’s first pass, the region was too dark to use the cameras. So MacKenzie and her colleagues had to factor in the change in instruments as a potential variable. But she’s still confident that something is different in the two passes, and that it’s pretty plausible that liquid was there, then disappeared. Even if the different signals over the two flybys were caused by some other phenomenon, MacKenzie said she’s still intrigued by what that could tell us about the strange moon, which is among scientists’ plausible candidates for where life may be lurking beyond Earth. “If we’re instead looking at some newly identified materials on the surface, then that’s interesting, too, because the sediments on Titan are really important for prebiotic chemistry,” MacKenzie said. But although MacKenzie focused on just three small lakes that seem to have disappeared, plenty of lakes remained visible throughout Cassini’s observations of the region. In the second paper published today, scientists used radar data to study a handful of much larger lakes. During Cassini’s very last pass over Titan in April 2017, the spacecraft was programmed to gather a very specific type of data, called altimetry, over the lake region to measure the height of different substances. 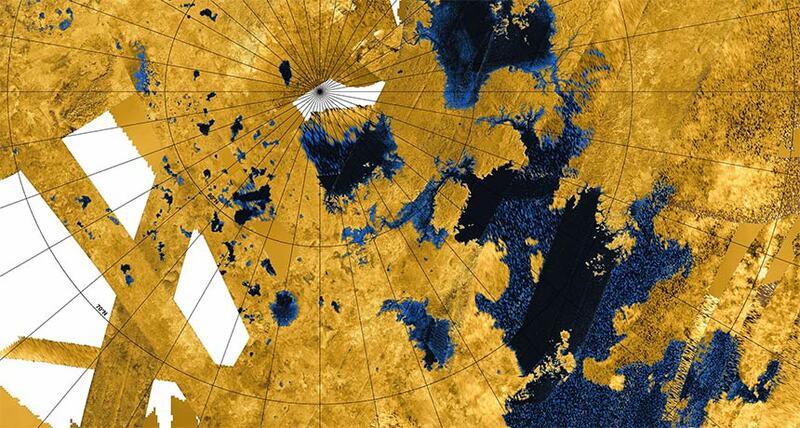 Marco Mastrogiuseppe, a planetary scientist at Caltech, had already used similar data to measure the depths of some of Titan’s seas, much larger bodies of liquids, and the Cassini team hoped he would be able to do the same with lakes. That suggests that below Titan’s surface, the moon may host yet another feature reminiscent of Earth: caves. On Earth, many caves are formed by water dissolving away surrounding rock types like limestone, leaving behind a type of landscape called karst, characterized by springs, aquifers, caves and sinkholes. Researchers studying Titan’s lake region think that they see similar karst-type characteristics. They also haven’t spotted channels connecting all these different liquid features, which is why Mastrogiuseppe and others suspect that some of the liquid may be seeping into the surrounding terrain, much like karst systems here on Earth. “Titan is really this world that geologically is similar to the Earth, and studying the interactions between the liquid bodies and the geology is something that we haven’t really been able to do before,” Lopes said. The new studies begin to make that happen by seeing those interactions playing out live on another planetary body. Such a mission likely won’t happen any time soon, but NASA is seriously considering a project called Dragonfly that would land a drone on the strange moon. If selected, the mission would launch in 2025 and reach Titan nine years later. And if NASA doesn’t choose Dragonfly, chances are good that another mission concept will come along. “Titan’s just to cool to not go back to,” MacKenzie said. Both MacKenzie’s and Mastrogiuseppe’s papers were published today (April 15) in the journal Nature Astronomy.